Mrs Claus and myself, along with our merry crew of Elves are busy getting prepared for our visit to Enniscorthy Castle later this month. My most trusted Elves transported the Magic Toy Machine to the Castle last week and along with the friendly staff of the Castle, they are busy transforming the Castle and getting it ready for my arrival. 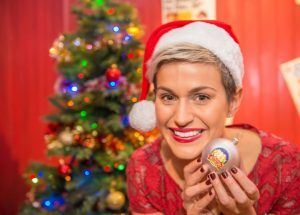 Well, there so much to tell you about this year’s Santa’s Enchanted Castle and the two new additions to the tour – Mrs Claus Sweet Shop and the Santa’s Magic Selfie Mirror. Mrs Claus Sweet Shop is stocked to the brim with yummy treats for all the girls and boys along with her own homemade tasty juice drink. The children will have their own Special Enchanted Castle currency which they can use to “purchase” these yummy treats. Mrs Claus has issued a warning to both myself and the Elves that we are not to be indulging in the treats in the Mrs Claus Sweet Shop. And My Magic Selfie Mirror…. so excited about this new addition to this yearstour. You and your family can now get a #SelfiewithSanta selfie. You will receive a printed photo and also a copy will be magically transported to your email account. Now onto the Enniscorthy Christmas Switch on which take places on Saturday 26th November in the Market Square. An event which is not to be missed and I am so looking forward to it. You are all invited to experience the Magic of Christmas with FREE entertainment from 4pm. Visitors can expect to be wowed by 70 inspiring young ladies and gentlemen from the Enniscorthy Superstars Dance school headed up by Sharon Clancy with music, song and dance. I will be there along with Rudey the Elf and the guests from “A Quest before Christmas”. With lots of fun and games including a crowd game of Pass The Parcel where many lucky spectators will take away amazing prizes ahead of the final big Christmas Switch On of the lights with additional guests including Enniscorthy District Chairperson Oliver Walsh and Strawberry Princess Rebecca. Looking forward to seeing you all there as we welcome Christmas Spirit into this magnificent town.